Have you been considering getting laser eye surgery but aren’t sure if it’s for you? At the Wellington Eye Centre we offer a free laser suitability assessment, which is designed to help you find out exactly that. This suitability assessment is your first step to getting better vision without the hassle of glasses or contact lenses. We do this assessments to find out if your vision can be corrected with laser and if there are any reasons why laser eye surgery may not be suitable for you personally. 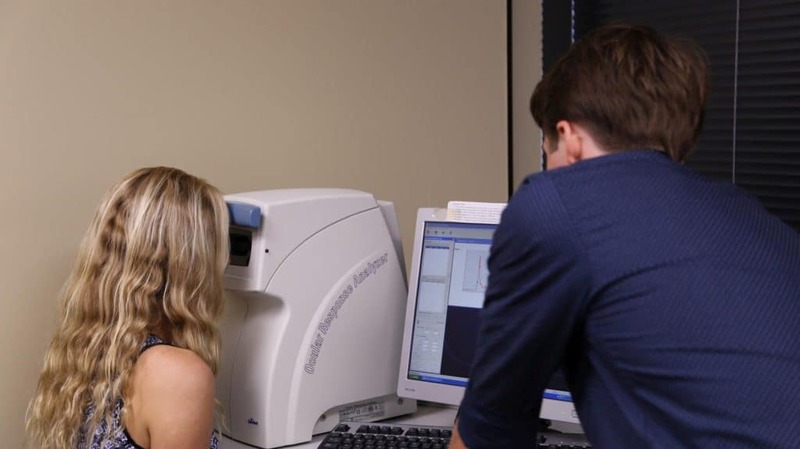 During the appointment you can expect us to do a number of scans and tests on your eyes, talk to you about your medical background, check your vision, and discuss the various laser procedures available. Your assessment will be completed by one of our friendly ophthalmic technicians and usually takes about an hour. There are a few things we need you to do prior to arriving for your assessment to ensure everything runs smoothly. Firstly, take your contact lenses out 48 hours before arriving – this is because contact lenses subtly change the shape of your cornea, which can make our corneal scans inaccurate. When you first book we’ll send you a welcome email with information about the practice and a patient registration form. It’s a good idea to read the information booklet and take the time to write down any questions before you come in for your assessment. During the assessments we often find people remember they had questions – but can’t remember what they were! When you arrive we’ll discuss your motivation for wanting laser eye surgery and go through some medical background questions. We’ll also check your vision with and without glasses, as it is important to know whether both your eyes are working as they should be. Afterwards, our ophthalmic technician will do some scans and tests on your eyes. To begin, we use an auto refractor to determine roughly what your prescription is. An autorefractor is a machine that attempts to figure out what it thinks your script is. this is useful for working out what your prescription is on the day of the assessment. We do this to make sure there are no discrepancies between your glasses prescription and the true script in your eyes. After this, we perform a corneal topography scan (Pentacam). This takes detailed measurements of your cornea’s thickness and its curvature. This is important because the laser procedures correct your vision by changing the shape of your cornea, so we need to know what shape it is to start with. During this scan, we may find your corneas aren’t suitable for laser surgery. In some cases, this is because the cornea is too thin or may be a shape that makes laser impossible. After the Pentacam we use an Ocular Response Analyser (otherwise known as a Puff Test) to blow some air onto your cornea to work out the pressure inside your eye. This is more of a health check test as high pressure inside the eye can lead to problems with your vision that cannot be fixed by the laser. We finish up by taking a few more measurements of your eyes such as the length front to back, the width of your iris, and the size of your pupils. These measurements inform how our ophthalmologist, Dr Logan, programs the laser to reshape your cornea, during the procedure. Once we have completed these scans we should have a good idea about whether laser is suitable for you or not. If all is looking well at this stage we’ll find out what your script is on the day. This is because the laser will not aim for a certain quality of vision (such as 20/20), instead it will aim to get your eyes as good as they can be at their best – we just need to know how good that actually is. For this reason it is important to know how well you can see. We finish up your appointment by discussing the various types of laser eye surgery. Our technician won’t be able to give you a definitive answer as to which procedure you are most suitable for; this will be done by Dr Logan during a medical assessment. Now is also when we can go through any questions you may have. If you have any questions that the technician can’t answer, they will talk to Dr Logan and get back to you with an answer. Doing the free assessments, we meet a lot of different people who have lots of questions. Here are some of the most common questions we get during the free laser assessments. We also have a useful article that demystifies some of the most common laser eye surgery myths – have a read! What sort of scripts can we correct? We can correct both near and far sighted people. Laser surgery can typically correct a script up to -10 in short sightedness and up to a +4 in long sightedness. As long as you’re in the range you’re most likely suitable. Can I have astigmatism corrected? Yes! We hear this question a lot when dealing with enquiries and in free assessments. Astigmatism is simply an irregularity in the curvature of your cornea. The laser is able to correct astigmatism of up to -4. Typically, the youngest we do laser on are in their early 20’s and the oldest are around 60. For anyone younger than 20 there’s still a high chance that the cornea is not stable and vision may change. If the vision is still changing and we were to do laser then it’s likely further surgery may be required. Once the cornea has stabilised, usually in your early 20’s, we can proceed with laser surgery. The upper age limit for laser is around 60, as after this point other eye conditions that affect sight start becoming more prevalent. Although, there may be other options, aside from laser, after this age so it’s still worth getting in touch. How good will my eyesight be afterwards? Laser surgery aims to get your eyesight as good as it can be. With that being said, results vary between patients as everyone’s eyesight is slightly different. We always manage expectations prior to surgery so you know what the outcome is likely to be. For example, if your vision can be corrected with glasses or contact lenses to see 20/20 before surgery, then that’s what we would expect after surgery. How long does it take me to get back to normal activities? We provide lots of information on post-operative care well in advance so you know what to expect. Following LASIK surgery you’ll need to take two days off work, followed by four weeks of avoiding swimming, saunas, spas, eye makeup, facial creams, vigorous exercise, and sweat in your eyes. With SMILE surgery, we recommend you take two days off work but only three days off of the above activities. Do we operate on both eyes on the same day? Most likely, yes. The surgery is very quick and simple but still requires a lot of prep time before you go in. Generally speaking, almost everyone ends up having both eyes done on the same day. The procedures are very quick. Normally on surgery day you’ll be in the theatre for about 15-20 minutes. The procedure itself only takes around five minutes of that time. The vast majority of time is for setting up, getting you prepped and calibrating the lasers. The SMILE procedure, for example, requires 27 seconds of laser, followed by around 30-90 seconds to remove the lenticule. This is then repeated to the second eye. LASIK involves 19 seconds under the first laser, we then lift the corneal flap which takes around 30-60 seconds, followed by between five and 50 seconds with the second laser. Finally, we take another 30-60 seconds to get your corneal flap back down and in place. After this, the process is repeated on the second eye. It may sound technical, but Dr Logan has completed laser surgery thousands of times – he’s one of the best surgeons New Zealand has! Often on the day of surgery you are only here for about one and a half hours. Before entering the theatre, your eyes will be numbed using anaesthetic eye drops. In most cases all a patient will feel is a sensation of movement on the eye and surrounding area, and potentially a slight feeling of pressure. After surgery the cornea may feel somewhat gritty and uncomfortable for about six to eight hours but pain is not expected. We’ll also provide you with pain relief medication such as Panadol and eye drops to keep you comfortable post-surgery. What if I blink or move during the surgery? You won’t be able to blink during laser surgery as we use a small speculum to hold your eyelids apart. You can’t blink because of this, nor will you feel the need to blink due to the anaesthetic drops we use. During the first part of LASIK, you need to hold still for 19 seconds, and for SMILE it’s 27 seconds. If you move or flinch during this time we may not be able to proceed with the operation, however there would be no lasting damage or changes to your eye. In our experience this is very unlikely to happen and the vast majority of people get through these short times very easily. Laser surgery permanently changes the shape of your cornea. Excluding other factors which could cause your vision to change post-surgery, such as the development of cataracts, an injury or infection (which is very rare), your vision should remain stable. In about five per cent of cases following surgery, the cornea may react differently to the laser than we anticipate, getting either flatter or steeper than planned. If this happens, usually the person involved would need an enhancement treatment, which involves follow up surgery. We cover the surgical cost for this for the first 2 years, following your initial operation. If this were to happen it would usually happen well within the first two years. Laser surgery will not stop the eyes’ natural ageing process. From around 45 years of age onwards, the lens will gradually start to stiffen and the muscles controlling it will weaken. This is what causes a lot of people to need reading glasses around this age. If you’re already past this age, we have a procedure called Presbyond which can counter this to ensure you don’t need reading glasses as you get older. This generally only works for people who are 45 or older and requires investigation by our team to find out if this will be an effective solution for you. Following surgery there are some compulsory appointments you must attend, so that we can ensure the healing process is going well. These are one day, one week, one month, three months and six months post-surgery. Included in the cost of surgery are 12 months of free post operative care, so we have you covered for all of these appointments plus any others that may be needed in between. If you’re based in Wellington or Napier where our two main clinic are, you can keep coming in to see Dr Logan there. For some patients who travel from out of town to get laser, it’s more convenient for them to go to their local optometrist for these check ups – the cost for those is covered by us. Laser surgery at the Wellington Eye Centre has a flat cost of $3180 per eye for all surgery types we offer. As we mentioned, the cost of surgery includes 12 months of free post op care, and 24 months of free enhancements. Check our blog on whether laser eye surgery can save you money. After the free assessment we normally have a pretty good idea about your likelihood of being suitable for laser eye surgery. If you’re borderline, we may have to give you a call-back a couple of days later after some calculations have been run on your measurements. While we can’t guarantee suitability at this stage, if all is looking well, you’ll be advised on the next steps. The next step in the suitability assessment process is a medical assessment. The medical assessment is going to look a little deeper into the health of your eye. It’s also your opportunity to meet our Optometrist and our Surgeon, Dr Logan. During this stage we will be dilating your pupils – something we don’t do in the free assessment; this is so Dr Logan can check the health of the back of your eyes. Assuming you’re still suitable after this, which most people are, you’re then ready to book in for surgery! You’ll be kept informed of the outcomes at each stage and advised of the next steps to take. The free assessment is a great way to come and find out if laser eye surgery is likely to work for you. It is also an opportunity for you to ask us as many questions as you like to find out all you need to know about laser eye surgery. We would love to meet you to discuss the options for correcting your vision. If you’re interested in laser eye surgery, or are simply tired of wearing glasses and contacts, we highly recommend you book in for your free assessment with us.